ARE YOU READY? DO YOU THINK YOU CAN HANDLE IT? It Takes Strength To Hold Your Own In The Air; It Takes Intelligence To Comprehend The Wind. Welcome to Aerosapiens!!! We at Aerosapiens are investigating the realities of the closest thing to human powered flapping flight in history. 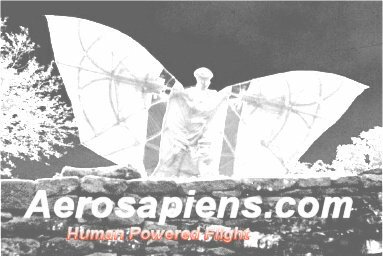 I, David Allan Moore, creator and founder of the ;Fletcher and Aerosapiens, have studied the flight technology of all flying things known to man. These studies include: the flight of dinosaurs, mammals (bats, flying squirrels), birds, reptiles, insects, airplanes, helicopters, balloons, ornithopters,&nbsp; hang gliders, parachutes, para-sails, as well as, all archeological findings of mans' ancient attempts at flight. Art history is one of my favorite points of interest when it focuses on human powered flight, such as, Mercury, Icarus, or Leonardo Da Vinci's interpretations on human powered flight. This invention is based on the flying properties of Bats: Order. Chiroptera. Humans are most closely related to bats for they are mammals. The bat is the only, real, mammal that truly flies. The Fletcher is made of rip stop nylon and aluminum tubing. The tubing is held to the main sheet by sewn in fabric sleeves and the tubing is held together by machine screws. All tube drillings are re-enforced by larger tubing sections that are predrilled. All the harness and controls are made of nylon belting,&nbsp; plastic adjustors and quick release clasps/ buckles. The aircraft is controlled by leaning, thrusting and contorting the pilot's &quot;human&quot; body to grab at wind force or to release wind force to form the appropriate wing shape for the desired type of flying or direction the pilot chooses to take. The Fletcher weighs 33 lbs. 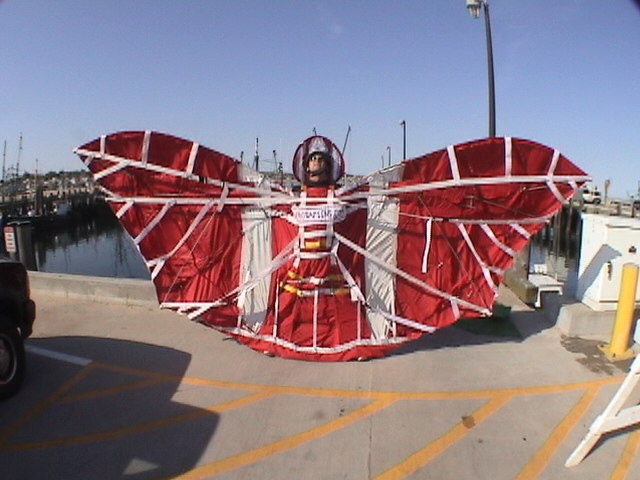 with a 16 foot wing span. The Fletcher has a great variability in its maximum surface area to its minimum surface area, making for extremely dynamic flight: from 100% lift to 30% lift with self propulsives capabilities beyond 100% lift, meaning, extra lift through a swimming type of effort or motion, similar to the Butterfly Stroke. The wing shape and size can be cut for different desired types of flying: ie. long thin wings for distance flying and short wide wings for stunt flying.&nbsp;&nbsp;&nbsp; PATENT PENDING. My latest design in need of frontal strap adjustment.